Yesterday while surfing on Pureflix I happened on a documentary on the book Experiencing God by Henry and Richard Blackaby, it was the second time I watched the video and again it inspired me to pick the book up again. It is a great book and I recommend it to everyone you can get the Kindle version for $2.99 on Amazon. The first time I went through the book I come away with a new and deeper relationship with God and I also discovered the most important relationship we can experience in life is our experiences with God (our ongoing experiences). “…an interactive relationship between God and people.” Each day I write a letter to God it’s my way of experiencing His daily presence, even though He has yet to write back He does have a unique way of getting through to me. The letters I write to God are much like a letter written to a friend or a loved one. A lot great deal of the time I write about the mundane things that goes on in my life. For example yesterday morning I wrote, “Good morning LORD! Put in a rough night, I can’t help but wonder where You are during those times when we’re not doing well and need Your help? Surely helping Patti or I get a good night sleep doesn’t go against Your Ultimate Plan for us.” Do you know how hard it is to write to someone who already knows what you’re going to write about? A couple of days ago while making our bed I looked up in the corner of the room and experienced God. The graphic included (you can tell I am not a graphic designer so please excuse its crudeness) is a visual depiction of how I experienced the Divine at work in our lives. 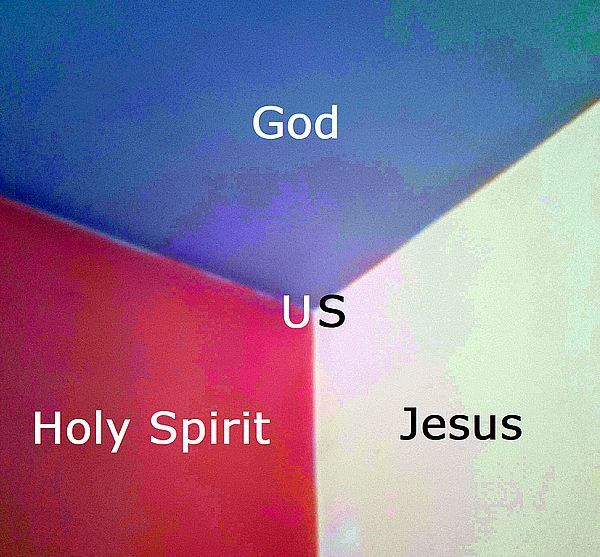 God at the top, Jesus to the right, the Holy Spirit to the left, and the three of them coming together in your life in mine.